Anthropological evidence has long suggested that psychedelic plants have played important roles in indigenous communities for thousands of years, but most scholarship does not address their formative impact on western culture. Through careful studies of art and archeology, Mushrooms, Myth & Mithras reveals compelling evidence that ritual use of psychedelic mushrooms was a powerful and closely guarded inspirational force in the development of early European culture. We discover that Nero was the first in a long line of Roman emperors to be initiated by secret "magical dinners" in which mind-altering mushrooms were used as a source of spiritual awakening. Although this sect was officially banned after Roman conversion to Christianity, aspects of its practices and teachings went on to influence many subsequent secret societies, including the Freemasons. 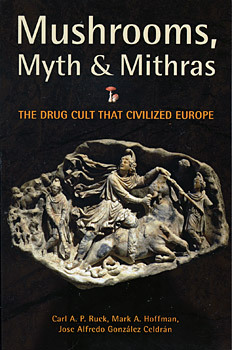 Mushrooms, Myth & Mithras is a fascinating historical exploration of a powerful force kept hidden for thousands of years. "An important book--by far the most comprehensive account of this thunderingly neglected topic that I have seen." "This is real renaissance scholarship. Mushrooms, Myths & Mithras is a brilliant and exciting synthesis of data gleaned from disciplines as diverse as anthropology, botany, linguistics, astronomy, archaeology, art history, pharmacology and classical literature. The history of recreational drug use it distills from the material and literary sources is both captivating and compelling. It effortlessly straddles the modern academic divide between the sciences and the arts. The authors' multidisciplinary approach sets a higher standard for research in the humanities."